Yoruba peoples in Africa live mainly in southwestern Nigeria and the neighboring Republic of Benin. 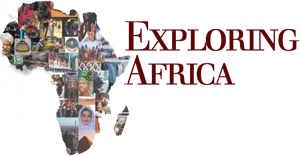 Yoruba peoples are one of the largest cultural groups on the continent, numbering over twenty million. Many Yoruba peoples were brought to the Americas forcibly through the trans-Atlantic slave trade from the sixteenth century until the second half of the nineteenth century. In the Americas, Yoruba culture has contributed to many African American traditions in the United States, Cuba, Haiti and Brazil. Oral literature recounts that Yoruba people originated in the city of Ile-Ife when the Supreme Being, Oludumare, sent Oduduwa and Obatala down to create the earth. Although this creation myth has many variants, it is traditionally accepted that Yoruba culture began at Ile-Ife, and it was there that the first kings and queens ruled. The Yoruba kingdoms stretched over swampy forests along the coast of the southern Atlantic and inland–rain forests, savannas, and grasslands–to the Niger River. Each of the kingdoms was an autonomous city-state, and today their names are used to designate the sub-groups of Yoruba peoples (Ife, Oyo, Owo, and Ijebu in the Nigerian part of Yorubaland; and Ketu Shabe, and Ifonyin in Nigeria and what is now the Republic of Benin). Although many people live in villages and farms, Yoruba peoples have a long history of urbanization and most live in large cities such as Ibadan and Lagos, the capital of Nigeria. According to Yoruba mythology, Oduduwa became the first Yoruba king (oba) at Ile-Ife. The various Yoruba city-states trace their founding to one of his sixteen sons, who all left Ile-Ife to establish their own kingdoms. Therefore, Yoruba kings guard and use their divine origins, since they are considered direct descendants of Oduduwa. As is typical of many divine kingship traditions, kings (and queens) are not only political leaders but also play important religious roles as well. As a divine king, the oba shares the responsibility to mediate over spiritual matters with the priests, elders, and other religious specialists. The Yoruba cosmos is conceived of two distinct but interrelated realms: the world of the living (aye) and the other world (orun), which is the realm of the Supreme Being, the ancestors, spirits, and gods (orisa). The king is considered to be important to the spiritual well being of Yoruba peoples because he has been accepted to be a link between these two worlds, as a representative of orun living in this world. As divine kings, they have access to special powers and extraordinary wisdom. The king of course has many responsibilities and privileges that come with his high-status role. Archeological evidence shows that Ile-Ife was already commercial and cultural center in the eleventh century and many others were also thriving. These city-states were independent of each other, each being ruled by an oba, or king. Because most kingdoms depended economically on commerce and trade, competition between each independent city-state was often fierce, sometimes resulting in war. Today there are still many obas throughout Yorubaland, although their role has changed since both the Republic of Benin and Nigeria have democratically elected leaders. Just as in the past, each royal court commissions artists to create beautiful artworks that are symbols of power and prestige for each royal lineage. Especially important to any king or queen are their regalia, which are all the accessories and costumes that a king or queen wears on official occasions. This activity focuses on Yoruba royal regalia, highlighting how African artists create beautiful objects that are worn and used by high-status people to reinforce their authority. You will investigate how art forms can actively project privilege and power. You will identify the symbolic meaning of visual signs and consider how these images can be ‘read’ as messages that connects kingship to the divine. After you have read the introduction above, look at the image of Deji of Akure and his attendants and the two beaded crowns. Figure 1: Deji of Akure with young attendants holding ceremonial swords 1959. Photograph by Eliot Elisofson, Museum of African Art, Eliot Elisofon Photographic Archives, Smithsonian Institution. Figure 2: Beaded crown. Made by Jose Rodriguez, 1997. Beads, thread, feathers, cloth, wood, shells. Collection of the Fowler Museum of Cultural History, UCLA. 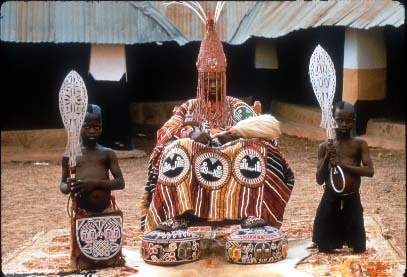 Look at the picture of the oba and the crowns (figure 1); discuss the details of how he is presenting himself. What is the oba wearing? How is he sitting? What attitude does he project? Who else is in the picture? Is there a reason for their presence? Can you guess what kind of occasion this is? How can you tell that this is an important, powerful man? What if he were sitting in an ordinary chair, dressed in a business suit–would your perceptions be the same? What symbols of power and importance can you detect? How do SYMBOLS contribute to a person’s projection of power in association? How do the arts establish and communicate power and authority? When these symbols are no longer being worn by their owner and are displayed in a museum, how do they seem different to you, do they still have the same power? Birds: A commanding bird at the top protects the powerful medicines inserted in the crown’s summit. Other birds may be added on the crown’s body. Birds are symbols of the mystical powers of women whose support is needed for the oba to rule effectively. The most senior official of the royal lineage is the one who places the crown on the head of the king during his installation ceremony. Faces: Their representation is said to honor Oduduwa (the first oba and the first ruler to wear a beaded crown). The face also represents the royal ancestors who are said to watch and protect the royal line. Faces can also represent Olokun, the sea divinity who is patron of bead artists and the symbolic source of the very beads that are used to create the crown. Interlace patterns: This interconnected and never-ending design refers to the continuity and balance important to life. On a crown it can symbolize the chain of divine ancestors that are all connected and linked to Oduduwa. Triangles: These are divided into smaller triangles and diamond shapes, repeated in a continuous pattern, imbuing the crown with a ‘shininess’ that reflects its sacred qualities. Beaded veil: It shields the face of the oba from the people who are not to look directly at his head because of the divine power he embodies. It signals that the king is connected to the gods. Beads: That these crowns are completely covered with expensive beads is a signs of royalty. Each color represents a different orisha or god and the king is protected by all the gods, and this symbolizes his divine ancestry. White: White represents Obatala, the king of the orisha. He is considered to be highly ethical, merciful, cool, composed, and patient. Red: Red is often associated with the Shango, a god who is often characterized as being proud and a great warrior. He is the protector and guardian of people. Elephant: A symbol of longevity and power. Look for each symbol in the crowns in figures 2 and 3. Identify each symbol and explain in your own words why each symbol is chosen and how they reinforce the position of the king. Write a paragraph that tells us what Yoruba kings want us to know about them by ‘reading’ the symbols you see in the crowns. What differences do you notice between the different crowns? Think of other leaders in the world. What do they wear to symbolize their power and authority? What do authority figures in the United States wear? The president of the United States dresses the same as everyone else; are there special clues to his role that are apparent when he arrives at a public or ceremonial event?